James 3:9 - With the tongue we praise our Lord and Father, and with it we curse men, who have been made in God’s likeness. 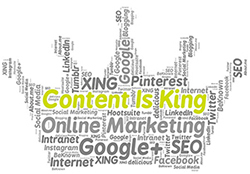 It has often been said that "content is king". Successful websites convey relevant content to their visitors and help them understand the problems that your products and/or services solve. Your content is the single most important element in increasing customers / clients. Make sure that the content you add to your site is displayed in a simple and clear manner. You should use language that will encourage your visitors to dig deeper for more information about your business or organisation. You should include keywords that are relevant to your business or organisation in your page titles, meta tags, headings and in your website’s content so that your potential customers can find you. This is called Search Engine Optimisation (SEO) and is covered in the Promote section of our website. Successful Christian websites have one thing in common - they are designed with both Christians and non-Christians in mind. These audiences will be looking for different kinds of information on your site so how do you please both? Check out our Content Tips as well as suggestions for Christian and Non-Christian content. Also take a look at some of the suggested resources. Ultimately, your site may be the best looking site on the whole Internet but if the content is poor nobody will bother visiting.